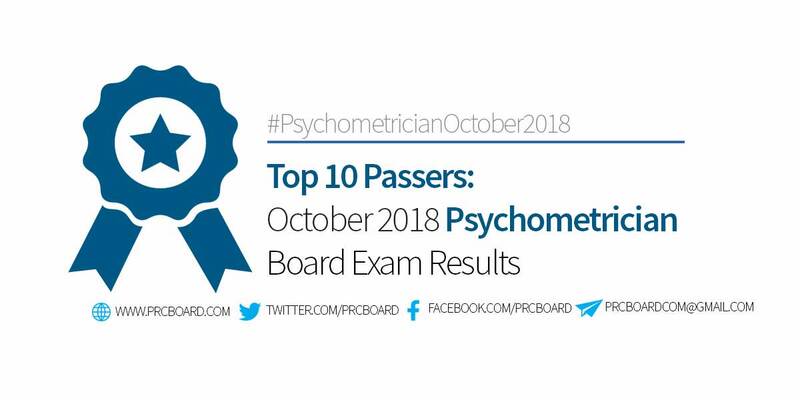 The top 10 passers in the October 2018 Psychometrician board exams are available at this website as PRC Board of Psychology releases the full results six (6) working days after the administration of exams. The Professional Regulation Commission (PRC) recognizes the top 10 examinees who garnered the highest examination ratings in any of its administered licensure exam. Shown below is the complete list of October 2018 Psychometrician top 10 examinees including the school they're from as well as their rating. The list is courtesy of PRC. As mentioned in the main page of this article, official results will be published on or before November 8, 2018 (Thursday). Meanwhile, to keep updated on the official result of October 2018 Psychometrician board exams, you may also follow us at our social media accounts via Facebook and Twitter. As if naman na meron talagang ganyan. Di ka ba nahihiya para sa sarili mo kung sakali. May lisensya ka nga incompetent ka naman. Walang kawawa sa ganun. Gusto nyo ba ng incompetent na doctor? QUESTION: I'M EDWARD CASIS MARANAN AND 83.10% ANG RATING KO....SO "TRACEY" WHAT ARE YOU DOING UP THERE?? ?ATTENTION PRC!!! Would you mind sending a screenshot of your grade verification as proof? You might have an average greater than 83 but fail to pass a requirement of 60 in a 100 item exam. You sound suspicious for there are no Edward Casis Maranan who passed the 2018 Psychometrician Board Exam.